Paradiso Festival will be held at the beautiful Gorge Ampitheatre on June 14th and 15th, 2019! 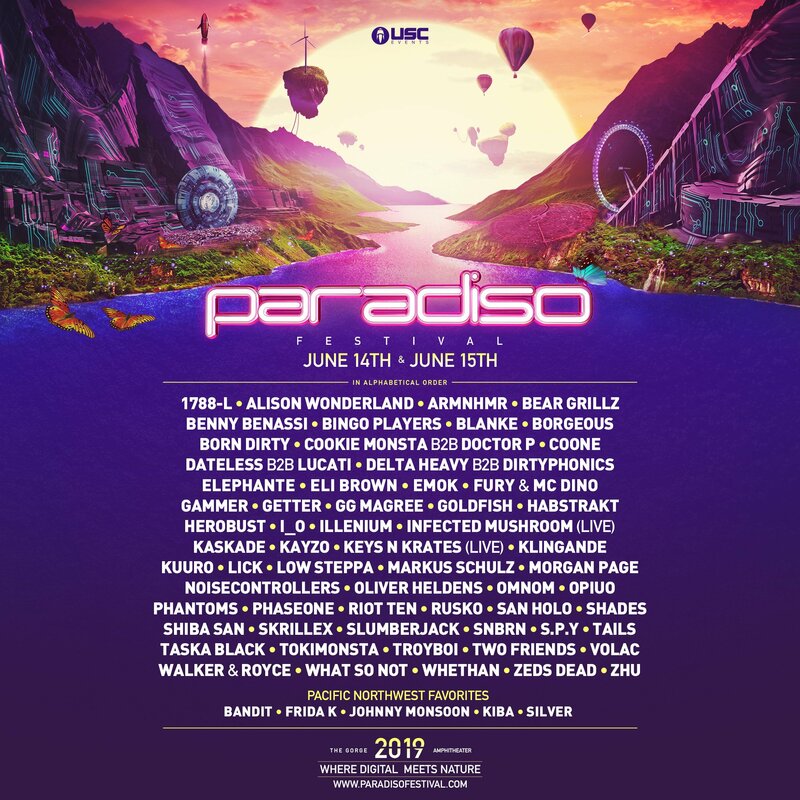 USC Events is excited to announce the 8th annual Paradiso Festival! Journey home to the breathtaking Gorge Amphitheatre on June 14th & 15th 2019 for two days of life, love, music, and family. Get ready to be immersed in a land where modern technology and nature’s purity blend together in perfect harmony. Experience three stages with world class visuals & audio production, thrilling rides & attractions, some of the biggest names in dance music, a stunning natural backdrop you have to see to believe, and the best part of all, the Paradiso family. Full Lineup: 1788-L, Alison Wonderland, ARMNHMR, Bear Grillz, Benny Benassi, Bingo Players, Blanke, Borgeous, Born Dirty, Cookie Monsta b2b Doctor P, Coone, Dateless b2b Lucati, Delta Heavy b2b Dirtyphonics, Elephante, Eli Brown, Emok, Fury & MC Dimo, Gammer, Getter, GG Magree, Goldfish, HABSTRAKT, Herobust, i_o, Illenium, Infected Mushroom (Live), Kaskade, Kayzo, Keys N Krates (Live), Klingande, Kuuro, Lick, Low Steppa, Markus Schulz, Morgan Page, Noisecontrollers, Oliver Heldens, OMNOM, Opiuo, Phantoms, PhaseOne, Riot Ten, Rusko, San Holo, Shades, Shiba San, Skrillex, Slumberjack, SNBRN, S.P.Y, Tails, Taska Black, Toki Monsta, Troyboi, Two Friends, Volac, Walker & Royce, What So Not, Whethan, Zeds Dead, and ZHU, Bandit, Frida K, Johnny Monsoon, Kiba & Silver. Camping: Camping passes must be purchased separately, one for each vehicle. More information about the different types of camping can be found here. Note that it has historically been cheaper to purchase GA camping in person with cash at the campground entrance than to buy online. 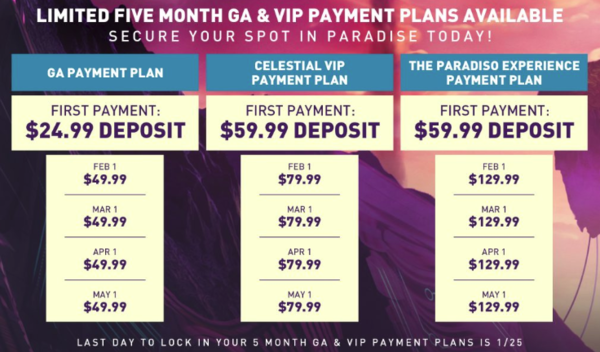 Payment Plans: 3 payment plans will be available, you must purchase a payment plan on or before January 25th. More information about the different types of tickets is available here.